These murals were commissioned by the YMCA of Albany, CA. If you click on the tab for each title, you can see images of the murals. Butterfly World was done in 2004 and 2005 for an enclosed courtyard. I researched butterfly images from every continent and painted them moving into a spiral to symbolize world unity. 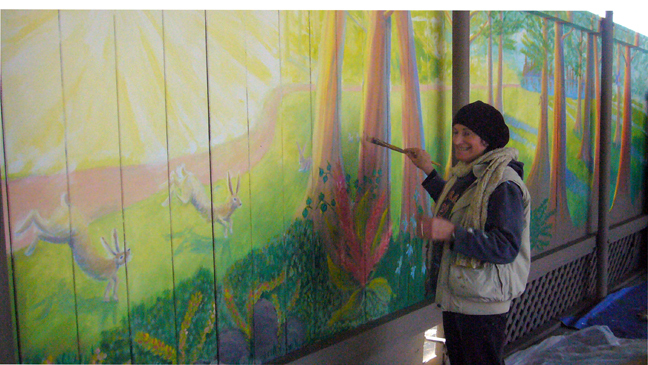 Native Garden by the Bay was painted on an exterior wall at the corner of Talbot Street and Solano Avenue in Albany, CA in 2006. The wall faces west, so I thought of painting the Bay view with the actual white picket fence extending into the distance of the mural to create a feeling of spaciousness. I painted the foreground garden with native California flowers which I researched and photographed at Annie's Annuals in Richmond, CA. On the white picket fence is perched a yellow finch, a native bird of California that I painted as a final touch. A synchronous event took place on the day I finished the mural. That evening at my drawing group I heard from figure model, Yoshio, that Lady Bird Johnson died that day. When I read about her, I was amazed to find that she was an advocate for planting and restoring native wild flowers to National Parks and along highways. She is wearing a yellow gown in her portrait at the national portrait gallery. Castle Mural was painted as part of the re-design of the child-watch room at the Albany Y.